Conditions for the second-annual Loup Loup Randonee Races couldn’t have been better this year. After several days of sun and warmth, a blizzard moved in at 2am on race morning and blanketed the course with freshies. The storm provided a dual benefit: it served to cover up all the miscellaneous up and down tracks which confused the race course’s skin track, and provided me with an excuse to rise at 4:45am and set the climbing track anew, then nab powder turns in the pre-dawn on the descents. 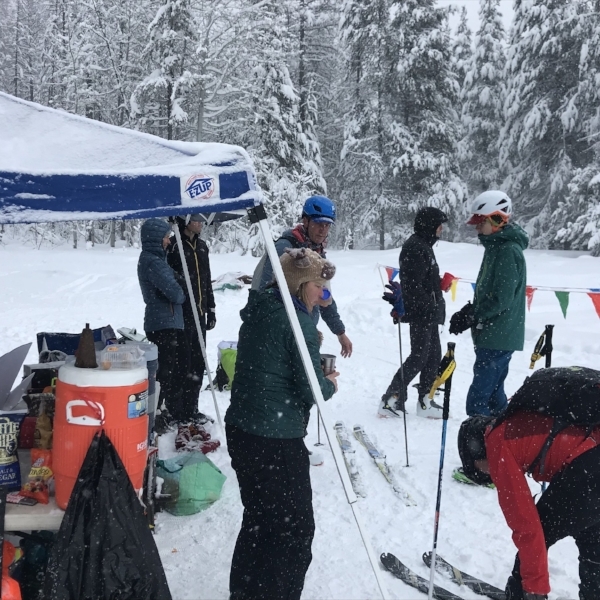 This year’s event featured one, two, and three lap race options (~1300’ gain/lap), as well as a new “ultra” race format: the 10,000ft challenge, inspired by four participants last year who vowed to skied 10,000ft every time they adventured together, and continued on after last year’s race. We loved it, and added an 8-lap option to this year’s calendar; somewhat to our surprise, the race caught on and usurped the shorter options. Race morning was a bit of a scramble with the blizzard ongoing and many racers stuck on the other side of the mountains due to weather. We postponed for 30min before sending the 10k stalwarts off. Moving quickly to the front were several race gear-clad competitors who maintained between 25-30min laps the whole race, an average climb rate of almost 3000’ per hour. Quickly breaking away to the front was young gun Peter Butler and man-about-the-mountains Patrick Fink. Trading leads and seeking every second’s advantage in transitions the two pulled away from the group and by the eighth lap Peter had gapped Patrick by over a minute. He crossed the line in 3 hours and 18 minutes, barely two minutes ahead of Patrick. Equally dominant in the women’s race, Canadian Marg Fedyna cruised through every lap in style and finished in 4:26, still only six minutes ahead of Seattle-based racer Holly Davis in 4:32. In the short course competition, Caleb Ambrose won the men’s 3-lap race handily in 1:12, while Methow local Abby Pattison won the women’s 1-lap in 41:30. Various competitors spread themselves out across the one- and three-lap races, our youngest racer only 17 years old and our oldest a sprightly 74! Beer and quesadillas flowed like wine at the aid station/finish zone and as the sun broke through in the early afternoon the 80s tunes cranked up, the bonfire surged, and racers pushed through cramps, hangries, and skin failures to complete their requisite 10k vertical. At the end of the day, 97% of the racers finished and an entire hour remained to ride lifts. Full results are here.